Layer the cucumbers, scallions, bay leaves, chili pepper and dill in a storage container with a tight-fitting lid. In a small saucepan over low heat, add the sugar, rice wine vinegar and Tamari. Simmer until the sugar dissolves. Pour the hot brine into the cucumber mixture and cover with a lid. Let marinate for 10 minutes, stirring every few minutes. In Recipes-list.com we have selected the most viewed recipes from category - uncategorized . Enjoy the best recipes specially selected for you! 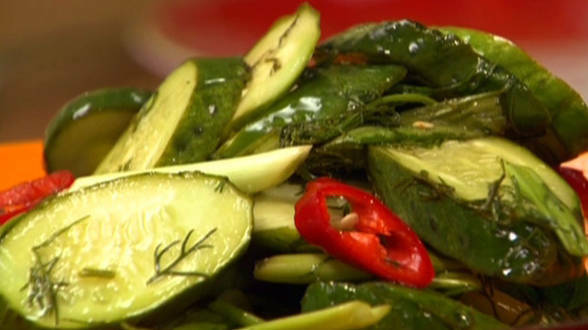 Asian Hot-Sweet Pickle Salad is the right choice that will satisfy all your claims.